Rachel and Skyler’s engagement session at Carkeek park in winter but you’d never know it from this gorgeous day the Pacific Northwest gave us! I love how natural and full of laughter these are to each other. Rachel and Skyler both race, and are going to display their cars at Hidden Meadows for their guests to see, alongside a 24 person bridal party! are really some of my favorites! 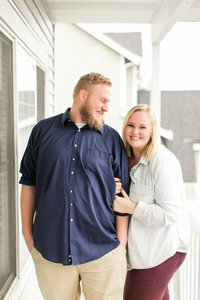 I typically do engagement sessions on weekdays, to avoid weekend crowds (and because of weddings!) It ends up being a win-win for our couples, they practically had the whole beach to themselves! It’s a nice way to do that first session with me without a big crowd! These two are the sweetest, can’t wait for their wedding day!